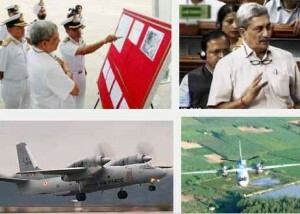 As the search for the Indian Air Force’s AN-32 transport aircraft missing over the Bay of Bengal off the coast of Tamil Nadu completed two days Saturday, families from Haryana’s Bhiwani town to villages in Kerala’s Kozhikode district, and from the Jajpur and Ganjam districts of Odisha to Pune in the nation’s west waited and prayed, clinging to the hope that no news now might just turn out to be good news later. Multiple aircraft and ships of the IAF, Indian Navy and Indian Coast Guard were scouring the waters in an area some 150 nautical miles east of Chennai, the last known location of the aircraft, braving high winds and choppy monsoon seas. The search and rescue mission was on round-the-clock, with Defence Minister Manohar Parrikar personally taking stock on Saturday. Twenty-nine people were on board the Russian-built aircraft on a routine flight from Air Force Station, Tambaram, near Chennai to Port Blair. Flight Lieutenant Deepika Sheoran, 26, who is posted in Port Blair, was on board the missing AN-32. Her father Dilip Singh Sheoran said he received a phonecall from the officer’s father-in-law around 2.30 pm on Friday saying the aircraft was missing. “We are praying that all 29 return safely. Nothing is in our hands now,” Sheoran, an executive engineer in the public health department, said. Sheoran said Deepika cleared the Air Force test in 2013, and was posted in Nasik before being transferred recently to Port Blair along with her husband, a commandant in the Navy. At Rajrooppur locality in Allahabad’s Dhoomanganj area, 56-year-old Narendra Nath Tripathi, his wife Meena and their younger son Kartikeya are awaiting news of Leading Aircraftman Laxmi Kant Tripathi, the family’s 25-year-old elder son. “An officer posted in Port Blair called up and informed us about the missing aircraft on Friday. This morning, some Air Force officials visited us and gave us specific details. We are worried about Laxmi and others on the aircraft,” Narendra Nath Tripathi, a farmer, said. Laxmi Kant joined the Air Force in June 2011. “I spoke to him last on July 21 night while he was going for dinner. Laxmi Kant said he would be leaving for Port Blair the following morning, and would call after he reached,” Tripathi said. Purna Chandra Senapati had come to his village Rangaranga in Jajpur district for two days on July 6, and had promised his ageing parents that he would come back. The 28-year-old technician had joined the Naval Armament Depot at Visakhapatnam two years ago after getting a degree in mechanical engineering. “He had called me around 7 pm on Thursday after reaching Chennai. He told me he would be leaving for Port Blair. He hasn’t called up since then,” said Ujali Senapati, mother of Purna Chandra. His brother Mohan is clinging on to hope. “One of his friends told me he may have missed the flight. But his cell phone is switched off,” he said.